stream all winter, but such a mild winter had placed us on the back foot and it seemed very likely that this planned campaign would never start, yet the arrival of the frosty mornings meant one thing, grayling and we knew we had to act immediately. A quick phone call told us that the river was just within its banks and although the clarity wasn’t brilliant we were assured that it was good enough to tempt the odd fish so with a three hour round trip ahead of us we set off well before daybreak. As we approached the venue we were able to look down across the flood plain and our enthusiasm dropped as we couldn’t make out the river as most of the surrounding fields were under water. We had been warned the river was high but didn’t expect it brimming its banks and racing through at a rate of knots, yet the clarity wasn’t too bad and knowing that the fish wouldn’t have fed for a while, knew we had a chance. Fortunately our nerves were settled within seconds as first cast Chris found himself playing a good grayling, one that fell agonisingly short of two-pounds. He had what’s known as a red-letter session in such difficult conditions and continued to catch grayling throughout the day, most just a couple of ounces short of our initial target of 2lb. I fished a number of swims and caught the odd big grayling along with losing something big so the early signs are great and another couple of planned sessions, very soon, should reveal its true potential, however one thing for sure, a two-pounder is certainly on the cards and who knows this piece of virgin river could produce something very special. Another fantastic part about this stretch of river is I have been allowed to take one guest each day, so if you fancy a day trotting a piece of scenic unspoilt, almost virgin river where seeing another angler is a rarity and the chance of catching a very big grayling is a possibility then please give me a call or email me. I have shown below exactly what a guided day consists off and how much it will cost, I will even drive you to the venue, blindfolded unfortunately, so with a limited number of days available between now and the end of the season, if you are interested then get in touch. Rig explanation and general watercraft. Cost of a full day is £135. Approaching a campaign on a completely new venue can be daunting, however adopting a new tactical approach as well as using a new bait could be classified as a recipe for disaster yet that’s exactly what we decided to do in our quest to track down a barbel of monstrous proportions! First problem was deciding on a venue, one that was capable of producing barbel in excess of fifteen pounds as well as being un-pressured! Impossible you may say but even in the south of England there are still the odd stretch of river that offers both. Once access was granted it was a case of getting to know the venue intimately and the only way of learning how the venue ticked and getting completely in-tune with it was to create a game plan, one that was to start in June and end hopefully in success March 14th the following year. Confidence in a bait is paramount and we were fortunate to get our hands on some Nash ‘The Key’ bait when it was in its testing stages. Initial sessions, in the depth of winter, targeting a difficult stretch of river with a very low stock of big fish instantly proved successful. This instant success came somewhat as a shock as we thought that it would take time for fish to switch on to a HNV (High Nutritional Value) bait, how wrong we were and a good stock of 10x15mm Dumbbells and 15mm boilies as well as Stick Mix, Frozen Paste, Pellets and Liquid Bait dip were ordered to kick-start the campaign come June. Eager to get started we decided not to wait till June the 16th but to take a stroll at the start of the month. This was to pinpoint six potential swims as well as baiting these lightly with a handful of bait. This baiting-up was carried out three times a week allowing a couple of days for the fish to find the free offerings and hopefully over time wean the barbel on to wanting these, and these only. Swims had been chosen carefully as well, two were what we call ‘hit and hold’ swims with fish holding snags downstream, two were drop-offs into deep water and the other two fast gravely runs in around four feet of water. We both knew that results wouldn’t happen overnight and had already agreed that a barbel in June or July would be a bonus. This may seem strange, especially after going to all the trouble of baiting up on a regular basis, but the first six weeks of the season can often be tough what with low levels, lack of oxygen and of course spawning. What we wanted to do was to give ourselves the best possible chance of unlocking the rivers secrets and if this meant feeding other species throughout the summer and then gradually drawing the barbel in over time then so be it. Late August we assumed would be the month that the barbel were once again settled and feeding in a methodical manner and come September and October, well the flood gates should open. Our personal bests vary somewhat, mine is 16lb 10oz and Chris 11lb 10oz so although we hoped that both would be beaten we settled for a target weight of 15lb, anything bigger would just be the icing on the cake. Being an all-out barbel campaign and knowing that potentially a fish of a lifetime could grace our nets nothing was left chance. Two rods can be problematic and knowing that we wouldn’t increase our chances of hooking a fish by placing two baits on one spot decided that only one rod would be used with two maybe coming into use later in the year when the hazardous weed and marginal cover died back. Having used Scope rods for the last year or more and absolutely loving them it was agreed that 10ft 2.25lb T/C would be our choice with reels loaded with 12lb NXT D-CAM mono mainline. Rigs were to be kept very simple and although Chris decided on using a 2oz running Tractor lead my choice was to go with a 1.5oz inline flat pear with the hooklink quick change rig swivel pushed in creating a bolt effect. Hooklinks were made from 15lb Combi-link in the weed green colour with barbless Fang Gaper size 8 hooks attached knotless knot style. I had also placed a couple of tungsten Clingers above the lead with some Cling-on putty moulded around just to pin everything down and keep things as stealthy as possible without over complicating thing. With the river weed in abundance we needed to guarantee that our hook points weren’t masked so both used quick change rig swivels so that narrow PVA sticks filled with The Key Stick Mix could be threaded down and the hook point pushed within. On the hair would be either a 15mm boilie or a 10x15mm dumbbell, both being covered in paste and then this and the bottom of the PVA bag dipped quickly in Liquid Bait Soak. Trying not to spook any resident fish within our swims we tried to make just one cast and as long as the lead was felt down and a satisfying thud felt when it landed left for ninety minutes. If a fish came within this time then brilliant and maybe a second cast made, however if nothing happened then it would simply be a case of moving to the next primed swim. By adopting this roving approach we felt that we could learn quickly what swims were attracting fish, what species they held as well as covering all in a short period of time. Obviously if one started to produce barbel then more time would be spent in this one, but until this revealed itself it was all about being active and covering as much ground as possible. Since the traditional rivers season opened we’ve continued to bait the swims three times a weeks, sometimes after fishing. The first two visits produced just one bream of 7lb 10oz along with a hook pull from what felt like another. The odd fish has been spotted rolling over the spots, probably bream again but these will keep the spots clear of weed and all the time they are feeding then other species will come and investigate. We’ve just returned from an evening trip and it looks like the baiting is working as Chris managed a 7lb 2oz bream and myself a 10lb 14oz barbel which showed signs that it had just finished spawning. I also had a couple of big fish roll right over the baited spot in another swim so it certainly looks like the plan is coming together and maybe those flood gates will open sooner than later. I’m not sure exactly where this month has gone or if I have logged every session as it’s been so manic that I even forgot to keep my fishing record up to date which is just unheard off. Strange as it may seem but I actually don’t get out that much over Christmas, unlike many who seem to grab the holiday period with both hands, and it shows as just 11 sessions have seen me on the bank, either for myself or guiding. As you can see this isn’t the whole story as most of my time has been spent getting articles to publications on or, as it’s been this month, before deadlines. I wish I could say that an article can be completed in a day, yet travelling down to let’s say, the Dorset Stour, taking the photos before travelling back all takes time, in fact just this is a day’s work. Then the article needs to be written up along with images manipulated and then everything sent, another days work, so you can see where my time goes, so although I love my job, it’s far from casting a line all day, every day! Fortunately with lots sorted well before Christmas it does allow me to spend time with the girlfriend and family, before getting right back into it come the start of January. I would like to reassure every river angler that’s been struggling to catch that it’s not all down to your angling. Ask yourself this simple question – what day in December was the best day to target barbel? You would be struggling to pinpoint one specific day as almost every day has been screaming barbel and knowing that they can feed pretty much 24/7 being on the bank at the right time is almost impossible to predict. It’s not just barbel that are proving difficult as other species like roach, perch, pike, grayling and chub need a consistent cold spell to get them into their normal winter routine. I know a few anglers that had a feeling that the crucians would still be on the feed early December but this species is one that is predictable and I put it down not to the air or water temperature but the length of daylight hours as after the first week of November they become so difficult to catch that I’ve learnt to leave them alone to the following spring. In these mild conditions why are the cats not feeding? Yes the odd one, just like the odd crucian does get caught but once again I put this down to the amount of daylight hours and not the water or air temperature, so some species are still predictable. I find it funny when I watch so many anglers struggling at Broadwater in these conditions; however this isn’t because of the weather which is so often blamed. If they were to arrive at first light, weren’t stereotyped into what swims they wanted to fish, moved to showing fish and put a little thought into their rigs and baiting then believe me they wouldn’t be struggling! There are a few exceptions to the rule such as the roach fishing on the river Blackwater that has been brilliant this winter. Unfortunately I keep meaning to get myself down there and sample this but time just faded away in December, maybe January? I was looking at buying a ticket to target some big grayling, yet although I know the odd big one is showing, to me fishing for this species has to be when it’s so cold that almost every other species is a non-starter, so unless this weather changes it’s looking as if this won’t be happening. So was 2015 a good year? Well it has to be as three personal bests graced my net, two of which were from species I never thought I would beat! More details to follow in my yearly round-up coming soon. What plans do I have for 2016? To be honest I’m wishing for this horrid mild wet spell of weather to pass as if it continues I fear that the spring will be another long cold one. Barbel, tench, catfish and carp will all feature up until the autumn, after this who knows but one thing is for sure barbel won’t be on the list. All in all 2016 looks like it’s going to be a busy one and if I beat my tench and carp personal bests then I will be a happy angler. 1/12/15 – Well what a day, well actually not! I was hoping to head to the river last night but the Amber forecast had me rethinking. Shame as the rain and wind failed to arrive and it would have be a great evening to fish. This rethink also made me change plans and a quick trip to the vets revealed that a simple shave of the rabbits bum was all that was needed so the first light assault was also missed. After dropping the rabbit off and a hearty breakfast I headed to the river, yet just as I arrived the phone went to say the bunny wasn’t as ill as first thought and was ready to collect, great that he was ok, great for the vets that cleaned me out of another £60 but not so great for the few hours on the bank. 2/12/15 – After dropping the girlfriend of I headed to my parents for a proper English breakfast before picking up one of my regulars for an exploration trip to his local lake in search of big perch. Conditions were spot on, however the farmer was pumping thousands of gallons of water into the lake and with a look like weak tea I knew things wouldn’t be easy. Prawn on the long rod was the tactic and with three swims baited we sat back to see what was install. Swim one produced one small dip of the float, swim two a carp of just over 10lb which livened up the session plus a tiny perch which came to a worm that a more than helpful match angler had given us and swim three, another smaller carp. All in all it was an enjoyable few hours in far from uncomfortable temperature, thirteen degrees to be precise and the friendly match angler gave us an honest account of the perch population which was there are a few big ones around but they are rarely caught and when they are they are more by accident than design. Job done! Back at home it was all hands on deck as I had arranged to meet my brother at first light for a spot of perch fishing myself so an hour or so was spent sorting out the kit as well as replying to the weekend’s load of emails etc. 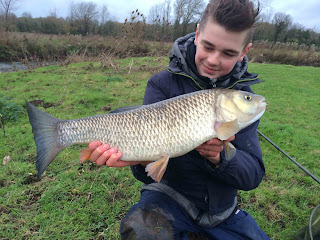 3/12/15 – Fished Broadwater today for perch. Both myself and brother Kevin had just two bites each fishing prawn in the four hour stint. I missed a definite perch bite and converted the other with a 15lb common. Kevin converted both his with a 10lb common and a 1lb 8oz perch. In the afternoon prepared the barbel kit for an overnight session Friday before popping over to see my mum who had a little trip earlier in the week. 4/12/15 – With one thing and another the mornings been somewhat wasted however on the road come 3.30pm and fishing by 5pm. Forecast is for a mild, dry night so should be a comfortable one. Oh, didn’t check the wind speed as it slowly got up as darkness fell to 22mph with gusts up to 42mph! To be honest nearly packed up at 2am as things were somewhat uncomfortable what with thinking the brolley would take off at any moment and that one of the old trees above that were swaying somewhat unnervingly would break off. Chris joined me and also had a similar uncomfortable night but was it worth it, well you will have to wait and see. 7/12/15 – Spent the day in the office checking out a number of carp rods for an Anglers Mail feature. 8/12/15 – Spent most of the day in the office checking out big-pit reels for an Anglers Mail feature, then at 3pm headed to the river in search of a massive barbel. Only fished four hours but managed to put two fish in the net, but what were they? 11/12/15 – Managed to head to the river, more to bait up than fish but took the rods and cast them out for a couple of hours. I say rods, as for the first time in my barbel fishing days I have now had to resort to two rods in the hope of increasing my chances. Haven’t done a great deal of fishy related things this week as having some time out with the girlfriend and getting things sorted for Christmas. Also had the news that my friend Alan had just landed a massive fish from the Test at Timsbury. What a shame that he never had the time to drink in the atmosphere surrounding the catch, look closely at the images and decide what to do with these as before he had even left the fishery a photo had gone viral on Facebook. Obviously the fisheries objective was to get as much publicity as they could by stating what they thought the fish was, well they have achieved there aim and you can bet your life that the already overcrowded banks will be even more busier in the next couple of months. I know Alan well and felt for him as many of the cyber claws seem to direct their comments at him and not the fishery, shame on you! My thoughts are that when an angler spends £25 to fish a day ticket venue, catches a memorable fish then it’s his rights to do what he wants with it, not the fisheries and in this case it was very disrespectful. If this had happened to me I would have been fuming! I would like to put his brilliant capture into perspective as I have fished Timsbury on many occasions and to catch anything other than a grayling or game fish is an achievement. In fact in maybe twenty visits I have caught hundreds of fish but only two can be classified outside of the game/grayling category, so well done Alan that was some fish! 14/12/15 – Spent the day writing up a few Anglers Mail Tactical Briefing before heading to the river to fish 2hrs either side of dusk. 15/12/15 – Made the most of a relatively dry bright day and managed to get the basic rod shots done for the Anglers Mail feature. 16/12/15 – Having spent most of the season fishing for barbel on a clear river who would have expected to arrive at the river Loddon to find it up-and-coloured water. This wouldn’t have been too bad if barbel were on the agenda but they weren’t as my customer, Christian wanted to learn the art of fishing for chub using bread! To be honest we decided to give it our best shot, fish all the good swims and if nothing happened by midday, throw in the towel and return when the river was in a slightly better condition. Luckily the weather was dry and mild and although little happened in the first three banker swims, the forth, one that is a bit hit-and-miss produced the goods, a chub approaching 4lb that gave Christian a right beating up. The odd half-chance then followed however it was obvious, even after trying cheese paste, that the chub weren’t that interested and although fishing till dusk I felt it was only fair to offer Christian another bash at ‘old rubber lips’ when the cold arrives! 17/12/15 – On the way back from dropping the girlfriend off at work I met up with my brother for a few hours pike fishing. It was more for a ‘catch-up’ than a serious fish and with temperatures well above average and the skies clear of rain clouds we sat and chatted along with getting three runs resulting in three pike to around 12lb. I was hoping to get an image of the double to complete a feature however to keep things short we named it ‘Houdini’. Back at home and in the office by midday I made the most of the weather and spent a few hours taking images of some big pit reels for an Anglers Mail ‘Best-Off’ feature. 18/12/15 – The weathers back to its wet and windy theme so time to review all the big pit reels and get them over to Anglers Mail slightly earlier than they expected before heading to the river to bait up. 19/12/15 – Today was all about getting on top of some outstanding fishy paperwork before Christmas. 20/12/15 – Another early start this time to pick up young Tom in Winchester and head to a couple of venues in Berkshire to get a couple of short videos done. 21/12/15 – Up early and heading south to the Dorset Stour at Throop to meet up with Pete Wilson on beat 2 to create an Anglers Mail Venue Expert. The weather was what can only be described as changeable and the red sky at dawn as I drove down was a sign of things to come. Fortunately arriving early with no more than a two hour window before the wind and rain moved in was enough to get everything sorted including Pete catching which wasn’t a foregone conclusion when he arrived to find the river up, fast and coloured. Keep an eye out for this feature in Anglers Mail as it’s a good one with plenty of great tips to learn. There was no let up for me even getting home early as it was straight in the office, once everything was placed on the radiators to dry out, to get on top of more things such as writing up a ‘where to fish’, once again for Anglers Mail. 22/12/15 – As if I needed another early start, especially knowing the weather was going to do its best to soak me once again, but yes, this morning I was once again on the road by 6am, this time heading to Wylands Fishery in East Sussex to meet up with carp angler Jed Kent to produce another Anglers Mail Venue Expert. Arriving a little after 8am I found Jed to have a sizeable carp ready for the camera, along with returning a couple of doubles, so things looked good for a few more fish, however the feeding spell stopped on my arrival. Keep an eye out for this feature coming soon to A.M as if you fish this venue then you will learn very quickly just how to approach and get the most from it. Some say I have the best job in the world, yet believe me as much as I love it, it is somewhat frustrating at times. The last couple of days should have been pure enjoyment, however as much as I did enjoy them the driving I hate ( the best part of 400 miles on the clock over two days) especially when its dark and raining. Early starts have never been my best point, yet once up I love them, and trying to be efficient with taking notes when everything’s getting wet and worrying that the camera equipment is going to pack in due to the damp is never far from my mind. Fortunately tomorrow looks a better day, however frustrating again as its a planned day in the office! 23/12/15 – With Christmas looming today was all about completing the Venue Expert feature on the Dorset Stour at Throop for Anglers Mail. 27/12/15 – It was good to spend a few hours on the bank with my brother, this time perch fishing at GAS Broadwater. The weather, although forecasted to be dry, did its best to dampen our spirits, yet a few bites in during morning session kept our minds away from the constant drizzle. I managed just two bites and missed both whilst Kevin had four on his perch rod resulting in a couple of scrapper two-pound perch and a few on his heli-rig which saw the odd better roach netted. 29/12/15 – I was hoping to get a few hours in pike fishing this morning yet this didn’t happen so headed to the river for a few hours instead and obviously the fish have been missing the pre-bait over the holiday period as within thirty seconds the tip tapped then pulled round, however that was the only action from the five hour session. 30/12/15 – You must have been on one of those sessions when it soon becomes apparent that whatever you do is just not going to make things happen. Well I had one of those today. I was on the Loddon roving around with a loaf of bread in the hope of a big chub. Conditions weren’t ideal, yet not impossible, or so I thought. Storm Frank was forecasted to arrive early afternoon so the early start saw me covering all the known hot-spots, however come early afternoon, the chub were like anglers on the bank, nowhere to be seen. In fact I tried fifteen swims for just two taps! Undeterred I headed to an easy stretch of the Blackwater yet after covering a further six swims for just one small chub and a couple of missed tiny taps called it a day when the rain finally arrived around 3pm.